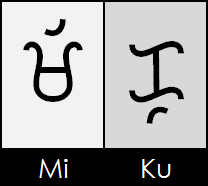 In Sulat Bisaya each consonant character is one syllable that is pronounced with the `A` vowel (as shown above) notice that all consonant characters ends with a default `A` vowel sound, for example: the character `Ba`(shown above) is not just a B like our modern day alphabets but it's a syllable `Ba` so if you want to write a word for example: Basa (read) you only need two characters, you do not need a set of four. 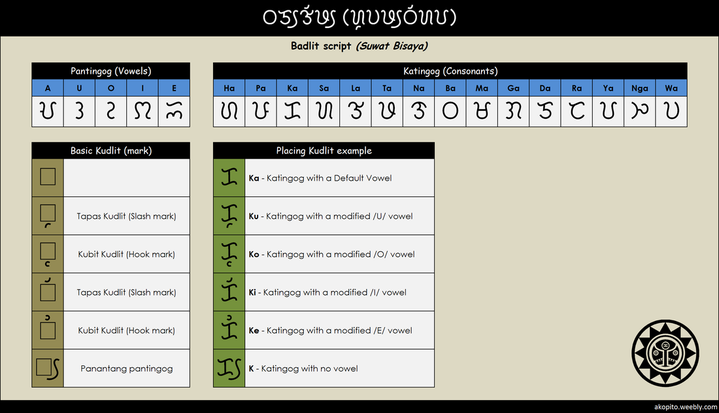 Suwat Bisaya is an Abugida, cross between a syllabary and an alphabet writing system. They use the same basic consonants, this combine them with a Diacritical mark called a Kudlit, the kudlit is use to express other vowels. example below, see how they use the same character, and only by adding a kudlit will change its sound. So what if I want to write a word without a sound vowel like the word `kidlat` the 'd' and 't' of the word Kidlat does not followed by a vowel sound, you cannot write 'd' and 't' since Suwat Bisaya consonants always contain a vowel sound. To solve this problem we need diacritical mark to terminate a vowel sound. The Panantang pantingog is place right side the character to cancel its inherent vowel /a/ sound.